Alaska Fishing Vacations. World Class Fishing. King & Silver Salmon, Rainbow Trout, Char. Come Along & Share the Dream. Spend A Week In Our Office. Where The Fun Never Sets! Our park has been carefully arranged for the guests that visit and the location is right on the beautiful Kenai River. Extra large spaces for big rigs and each has its own yard. Enjoy our peaceful location and longtime Alaskan hosts. When in the Soldotna-Kenai area, make the beautiful Soldotna Bed & Breakfast Lodge your home away from home. It is a lovely 16 bedroom European style home located on the banks of the Kenai River, yet within walking distance of downtown Soldotna. Welcome to Ron Fay's Moose Creek Lodge located on the Kenai Peninsula, long known for its unmatched world class fishing, incredible beauty, and tremendous variety of wildlife. The Kenai's premier fishing resort! 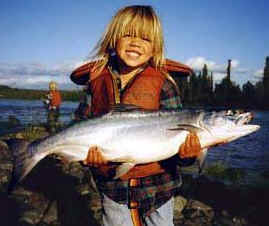 No where in the world will you catch salmon and halibut in such size and numbers as the Kenai Peninsula. Let us help you experience the Kenai and all it has to offer. Come join us for some of the greatest fishing in the wold. We can provide you with all you need to experience world class sportfishing! Come Experience Our Relaxing Hospitality and Our Knowledge of The Area's Variety of Sportfishing. Out of Bed .... and into the Boat! This site created and maintained by AKPHIL.